In advance of their debut album, American Stranger, LA band Lunden Reign has been getting gushing praise from musicians and other industry types already. By example, Dale Bozzio, of Zappa and Missing Persons fame, is quoted as saying, "American Stranger is a masterpiece! Every song is great!" Well, damn, what's the point of going on, might as well hang up my keyboard now. What shall we say then about Lunden Reign. 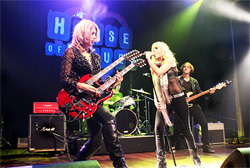 First, the band is principally guitarist, lyricist, and composer Lora G. Espinoza-Lunden and vocalist Nikki Lunden. Not sure of the relationship. 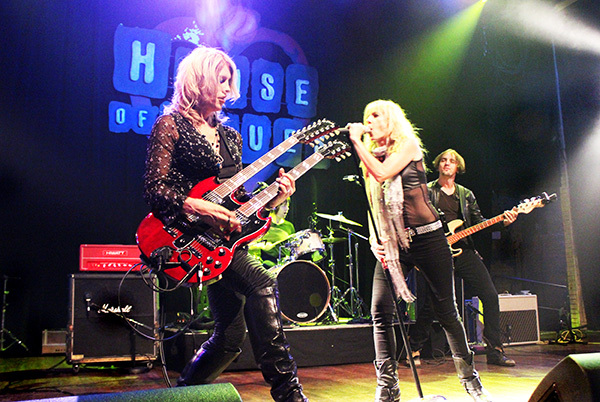 Their musical style is basically melodic hard rock, big on riffage and beat. Some are saying it's progressive rock as well. But I don't hear it. In her composition, Espinoza-Lunden seems more interested in chord structure and it's development, but with these subtle flairs of nuance, in each song. She is a riff master, and as you move through the album these riffs define Lunden Reign's sound, with little variation. Also, she doesn't appear to have any interest in playing lead. I don't recall a single guitar solo. Perhaps they were there and ever so subtle that I just missed them. Okay, there might be one in When Love Lies, but I could be wrong. What's a hard rock album without some thrilling lead guitar solos? The proper answer is, boring. Nevertheless, Espinoza-Lunden's guitar creations and subsequent interpretations are interesting to ponder. The album is a concept album about a girl estranged from life and relationships, so expect a lot of female angst and reflection. That is if you can catch the lyrics. There is no lyric booklet, and Nikki Lunden can sometimes be heard to discern. Sometimes her enunciation is blurry, somewhere between lisp and slur. Most times, though, she sings sweetly, often soaring, and with emotion. Combined together, Lunden has some Stevie Nicks in her soul. So what to conclude. I'm not sure what the fuss is all about. Put the parts together, including the fine production, and American Stranger sounds good overall. But I think maybe only one or two tunes really stopped me: the very catchy, pop accessible, sound of Hush & Whispers and the bold riffs and rolling lyrics of The Light. After these things, the Lunden Reign sound kind of runs together. After the first few songs, you basically know how the rest of the album will sound. Well, there's a lot to be said for consistency. 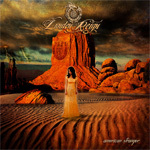 Lunden Reign - "The Savage Line"
Already being heralded as a masterpiece by some, Lunden Reign's American Stranger offers modern melodic hard rock driven by an abundance of imaginative riffage and emotional vocals.